Insurers are bracing for $20 billion of damage from Hurricane Florence, following record losses in 2017. Rising claims aren’t the sector’s only problem: hedge funds and other new investors are eroding margins too. The best way to survive may be swallowing a rival. 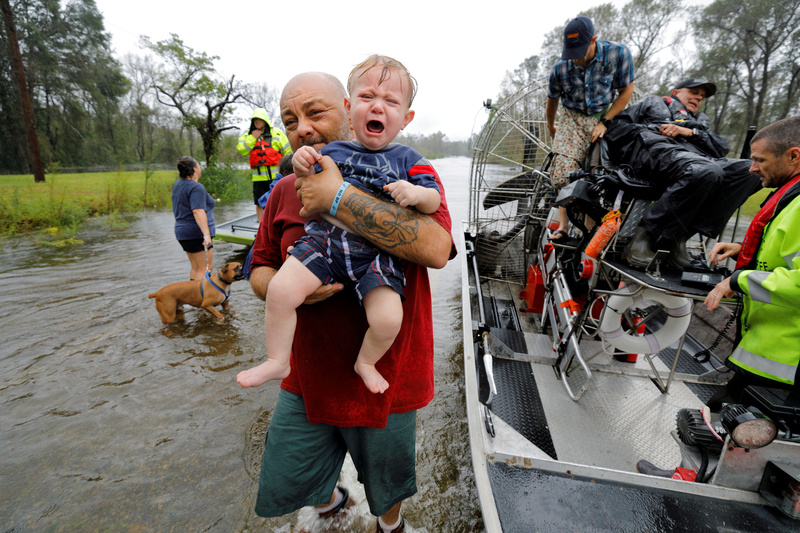 Oliver Kelly, 1 year old, cries as he is carried off the sheriff's airboat during his rescue from rising flood waters in the aftermath of Hurricane Florence in Leland, North Carolina, U.S., September 16, 2018. Insurers could face losses of up to $20 billion from flooding caused by Hurricane Florence, which made landfall on Sept. 14 in North Carolina. Damage is likely to be in line with losses from previous hurricanes in the area, according to a report from risk-modelling firm RMS on Sept. 11. Hurricane Hazel, which ravaged North Carolina in 1954, caused $15 billion in losses, while damage from Hurricane Hugo in 1989 totalled $20 billion, according to RMS. Florence, a hurricane that weakened to a tropical depression by Sunday, has dumped up to 40 inches of rain on parts of North Carolina since Sept. 13, and continued to produce widespread rain over much of North Carolina and eastern South Carolina, according to the National Weather Service.